UPDATE JUNE 15, 2018: A jury has found Brandon Hanson guilty of all five counts in Makayla Rhiner's death, including murder with use of a deadly weapon, burglary in possession of a deadly weapon, robbery with use of a deadly weapon and two counts of break, injure or tamper with a motor vehicle. His sentencing is scheduled for 9 a.m. Aug. 7, just over a year after Rhiner's death. UPDATE AUG. 9, 2017: The family of Makayla Rhiner held a press conference on Wednesday to talk about what happened to Rhiner. One of the speakers was Rhiner's godfather. He talked about the type of person Rhiner was and about how much she is missed. He also spoke about the importance of women who are victims of domestic violence or might be victims to speak up. UPDATE AUG. 8: The man who is accused of killing a woman in her garage was apparently depressed and suicidal after the pair broke up in June. After Makayla Rhiner was killed, family and friends told police detectives about her ex-boyfriend Brandon Hanson. Rhiner met Hanson while attending classes at the College of Southern Nevada. The pair dated for about 3 months before breaking up. After they broke up, Hanson threated suicide. Rhiner urged him to seek professional assistance. Cars belonging to Rhiner's new boyfriend and her mother were also vandalized after the breakup and Hanson was the suspect. Detectives contacted Hanson on Aug. 5 and arranged to meet for an interview. Hanson admitted he suffered severe depression after the breakup but denied killing Rhiner. Hanson then terminated the interview. Detectives obtained a search warrant to search Hanson's house and cars. During the search, they asked Hanson if he wanted to talk. He agreed and confessed to killing Rhiner. He admitted he drove to her apartment complex to talk about the status of their relationship. He told police that Rhiner dismissed their relationship and that is when he became angry and began stabbing her. UPDATE AUG. 7: After investigating the circumstances around the murder of the 22-year-old woman in southeast Las Vegas, detectives have named 33-year-old Brandon Hanson as a suspect in this case. Hanson was reported to have been in a dating relationship with the victim. The Clark County coroner identified the victim as Makayla Leilani Rhiner of Las Vegas. Her cause of death was multiple stab and incise wounds. The suspect Hanson was located and interviewed on August 5 and has been arrested and booked into the Clark County Detention Center where he faces one count of murder. UPDATE 7 P.M. AUG. 4: A friend of a woman found murdered Thursday night described her as a smart, funny 22-year-old with a bright future. "It just didn't make sense to me and it still doesn't make sense to me," said Krissy Tayam, who knew the victim since high school. "She was a very ambitious, but simple girl." 13 Action News is choosing not to release the name of the victim until the Clark County Coroner's Office can confirm her identity. LAS VEGAS (KTNV) -- Las Vegas police are investigating the death of a woman on Thursday night. It happened at an apartment complex near Russell Road and Buffalo Drive. Her body was discovered around 7:30 p.m. 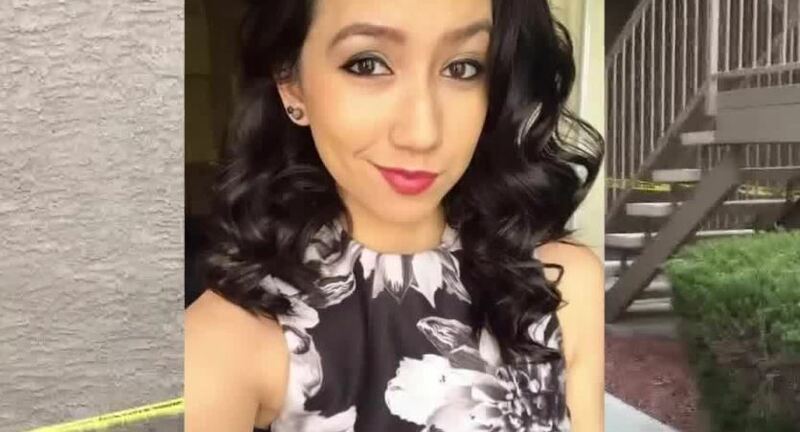 The woman was last seen in the office of the apartment complex around 5:30 p.m.
Police say the 22-year-old woman was found dead next to her car inside of an open garage. Investigators believe she may have been attacked from behind as she was trying to get to her car. A police spokesperson called the victim "a completely innocent person" who had no criminal history. Police say there appears to have been a struggle before the woman was killed. The Clark County coroner will identify her after relatives have been notified.